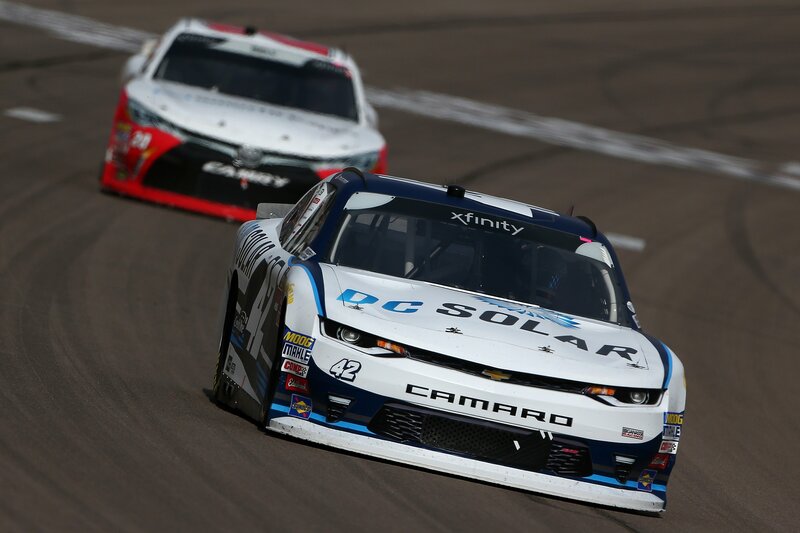 Today, the NASCAR Xfinity Series takes to the 1.5-mile in Las Vegas, Nevada. 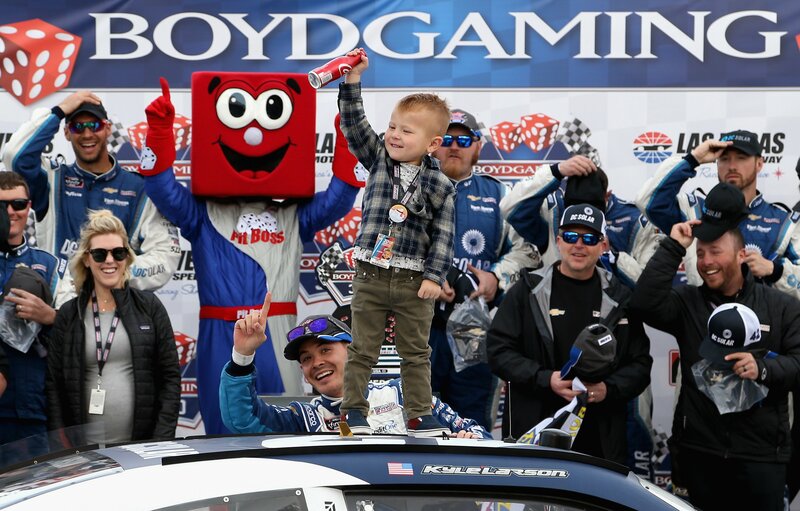 It’s the Boyd Gaming 300 and today’s field is full of MENCS drivers. View full NASCAR Xfinity results from Las Vegas below. Christopher Bell and Kyle Larson lead them to the green flag. 45 laps in stage 1, another 45 in stage 2 and stage 3 will feature 110 laps to conclude the 200 lap race. Green, Hemric spins his wheels from row 2. They head 3 wide into turn 1 for 2nd. Larson is barely clear off turn 2, he slides in front of Bell. He locks to his bumper and pushes Larson all the way down the back. Lap 6, the caution is out for Dylan Lupton. He’s made heavy contact with the inside wall just passed the pit exit. He came down on another car through the tri-oval, it sent him spinning across the infield. He clipped the end of the safer barrier and that sent him into a violent 360. Green, Larson gets the jump from the outside lane. Hemric gives Bell a push into turn 1. Even for the lead, Bell noses ahead at the center of the corner. Larson powers by on the outside at corner exit. Lap 21, Christopher Bell scrapped the wall all by himself a few laps ago. But, he’s gathered it back up and he’s running down Kyle Larson. He’s on his bumper. Lap 26, Bell looks to the outside in turn 1. He’s hard on the gas. Bell is sideways off turn 2 but he’s got a fender on Larson so he’s not lifting. Sideways, inches from the wall and inches from Larson but the #42 leaves him a lane. Bell takes the lead down the back! Lap 27, Larson finds lane three in turn 3. Bell gets loose on the bottom at corner exit. Larson is coming hard around the top, he swings back to the lead. This is great stuff! 3 to go in stage 1, Bell has a run down the back but he lifts early into turn 3. Larson is back on gas sooner and he gets a run off turn 4. Bell to the lead with 2 laps to go! 1 to go, Larson comes back, he retakes the lead into turn 1. Bell puts the pressure on in turn 3, Bell to the lead! He wins stage 1 at Las Vegas Motor Speedway! 22 cars are left on the lead lap. The field hits the pit lane. Larson is 1st in and 1st off. Reddick is off 2nd. Bell has lost 5 positions off pit road. He had issues with the jackman. “That was a lot of fun racing with Kyle. I’ve got a lot of laps with him in the dirt cars but those were our first laps together on pavement,” Bell says via radio after the stage 1 win. This time, Larson selects the inside line. Green, Larson gets a bump from Blaney they’re both clear into turn 1. The restart is under review. Upon the bump, Larson was jolted just under the white line. You aren’t allowed to go under the white line on restarts. NASCAr says it was ok because of the bump. They both went under the line but it was only 5 inches or so. 17 to go in stage 2, Kyle Busch is struggling. “I just got passed by Michael Annett and Brandon Jones so punch me now,” Kyle Busch radios to the crew. He’s running 10th. 5 to go in stage 2, Kyle Larson leads Ryan Blaney by 3.5 seconds. Kyle Larson wins stage 2 in Las Vegas, NV. The field hits the pits. Blaney and the Team Penske crew were 1.2 seconds quicker on their 4 tire pit stop. They beat Larson to the pit exit by a car length. Green, Cole Custer give a push to Ryan Blaney they lead the inside line to turn 1. Off turn 2, Larson is back to 2nd. Kyle Busch and Brandon Jones are banging fenders into turn 1 for 8th. Down the back straightaway Kyle Busch has his longest finger point out the window to the #19 of Jones who slots in behind Busch off the corner. 75 to go, Larson and Blaney are fighting for space on the track and the lead of the race. Larson picks lane 3, Blaney does as well. Back into turn 3, Larson pulls a slider on Blaney. He parks it in front of Blaney and blocks a little on corner exit. Larson retakes the lead. Blaney is still fighting. He picks his way to the inside between Larson and a lapped car through the tri-oval. They are even into turn 1 but Larson holds him off and begins to drive away. 67 to go, big crash down the back! Austin Cindric was 3 wide with Tommy Joe Martins and Ryan Reed just outside the top 10. He lost the nose on the bottom. As the downforce evaporated, he drifted up the track. With a bunch of wheel in it, the car whipped around. Cindric hits the inside wall down the back. The caution is out. The field comes to the pit lane. 14.3 second stop for Cole Custer, he leads off pit road. Kyle Larson is -7 at the pit exit. Blaney is off 2nd. 62 laps to go, everyone is being told to save fuel. Green, Cole Custer gets a huge push from Justin Allgaier. They lead into turn 1. 61 to go, Custer slips up the banking into turn 1. Justin Allgaier is on his bumper and he fills the hole quickly off turn 2. Allgaier to the lead in turn 3. 52 to go, Allgaier might be stacking up the leaders a bit. Blaney and Larson have both reeled in Allgaier and Custer. They split Custer. Larson looks to the outside of Blaney through the tri-oval. Blaney tried to block the inside at the last second, Larson just switched to the highside into turn 1. 49 to go, Larson is running lane 3 into turn 3. He’s got a huge run of momentum off turn 4 as Allgaier runs the bottom. Larson is significantly quicker on the exit. Allgaier slides up in front of Larson off turn 4, Larson cuts to the bottom through the tri-oval, he’s the leader at the line. Laron’s crew does not think he can make it on fuel. He’s going to have to save fuel. 34 to go, Kyle Busch hits the pit stall. He’s rolling the dice at Las Vegas. Pass through penalty for Kyle Busch. The fuel man caught a tire, he’s not allowed to do that. 16 to go, the caution is out. Ryan Reed has a flat right front. The leaders hit the pit lane. Larson is 1st in and out 3rd. Tyler Reddick took 4 tires yet picked up 3 positions. Green, Reddick has help from Blaney. Larson has help from Bell. They head side by side to turn 1. Blaney bails, he looks to the outside. They split Reddick. Chastain is around down the back, caution. Kyle Busch gets the free pass. Green, Larson gets the jump on Bell. Wheel spin for Bell all the way to turn 1. He gathers it through turn 1 and he’s glued to the bumper of Larson down the back. 5 to go, Larson leads by 0.3 seconds. Larson drives away. 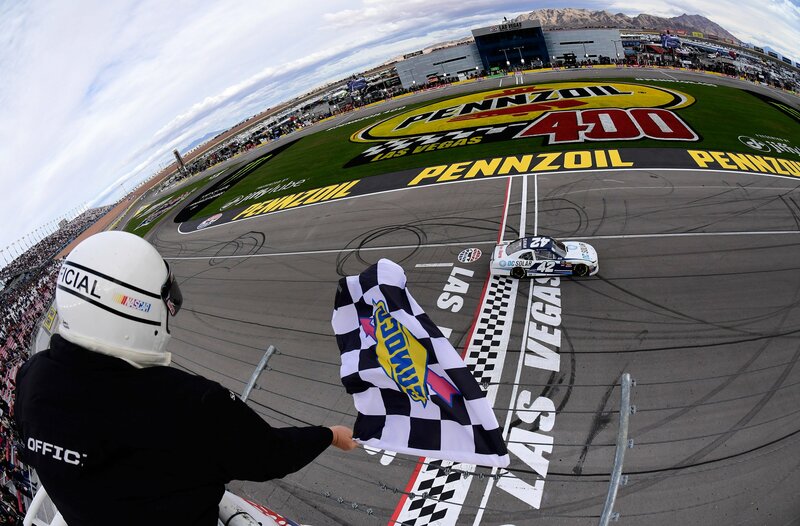 He wins at Las Vegas Motor Speedway! 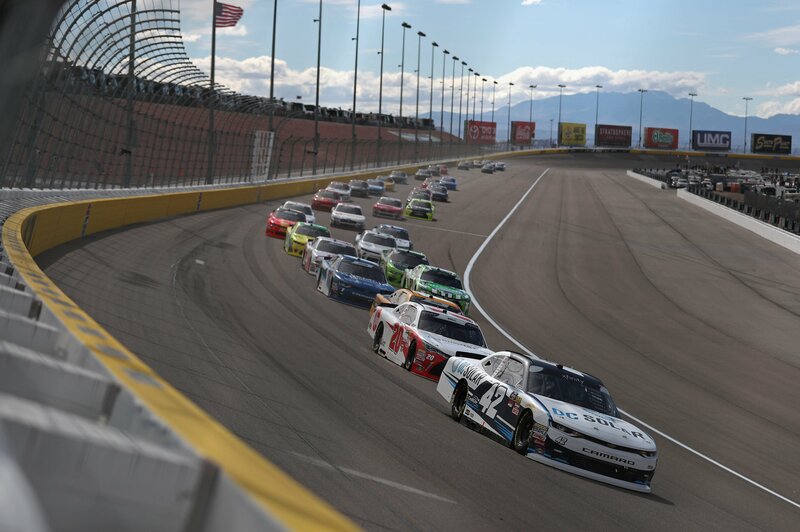 View full NASCAR Xfinity Series results from last Vegas below.